4th Battalion Yorkshire Regiment. Formerly 34721 9th T R Battalion. Died 12 April 1918. Born Enfield, Enlisted Tottenham, Resided Enfield. Commemorated Panel 4, PLOEGSTEERT MEMORIAL. 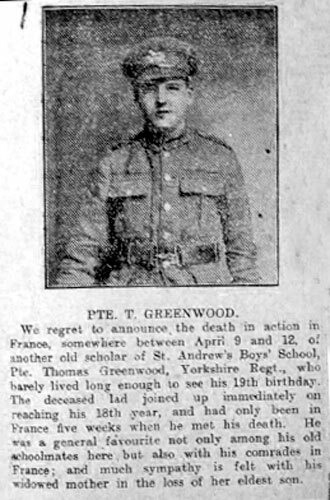 A contemporary newspaper report mentions Private Greenwood's death. To see this report, select the thumbnail image above.